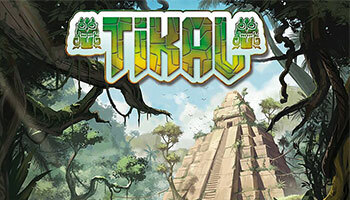 Tikal is a game of exploration within the Central American jungles in search of lost temples and the treasures within. Players send their team of explorers into the jungle, exposing more and more of the terrain. Along the way, you find temples that require further uncovering and treasures. Players attempt to score points for occupying temples and holding onto treasure. Tikal is the most important and largest of all Mayan sites. It is located in the midst of an impenetrable jungle in northern Guatemala. The Mayans lived in Tikal from 600 BC to 900 AD, but little is known of the civilization that thrived there for 1500 years. As of this writing only a small fraction of the site has been excavated and investigated. Up to 4 expeditions plan to further explore the site to excavate and recover other temples and treasures. If players want a game with more tactics and a bit less luck, they should play using these auction rules. The rules of the basic version are followed except that the terrain hexagons are auctioned instead of being drawn. The turns are grouped into rounds with the round size equal to the number of players.